Paris surprises and delights with every visit. My travels last month took me and my trusted touring companions across the City of Lights in search of more markets, restaurants, bars, and shops to recommend to the Compass & Key community. I've narrowed down the list to my top five, and while none of these destinations are brand-new developments, they were new to me, and I couldn't wait to share them! 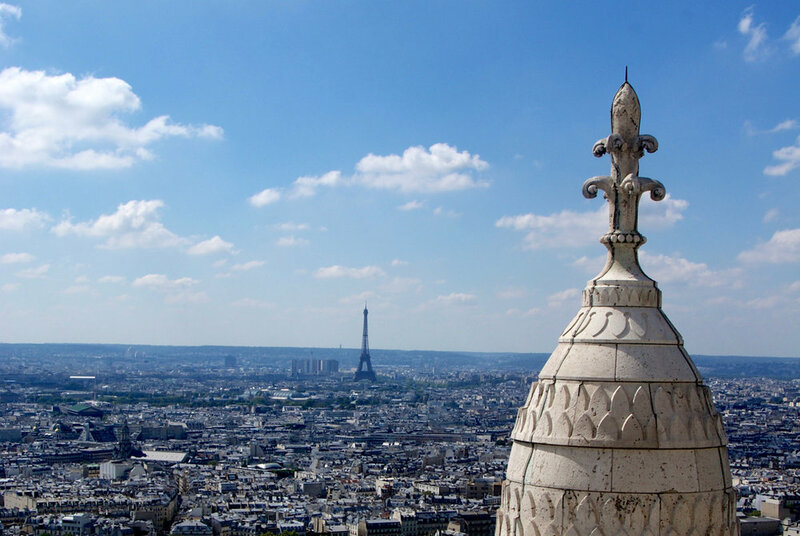 Easily remember these spots for your next Paris vacation using personal mapping app, Mapstr. Just follow the Compass & Key map (find us @compassandkey) to view these five spots along with 60+ other places featured in our Paris Destination Guide. Or, save each spot individually by clicking on the image below each description (learn more with our Mapstr Review). If you know where you'll be staying in Paris, use the CityMapper links for public transport and walking directions. 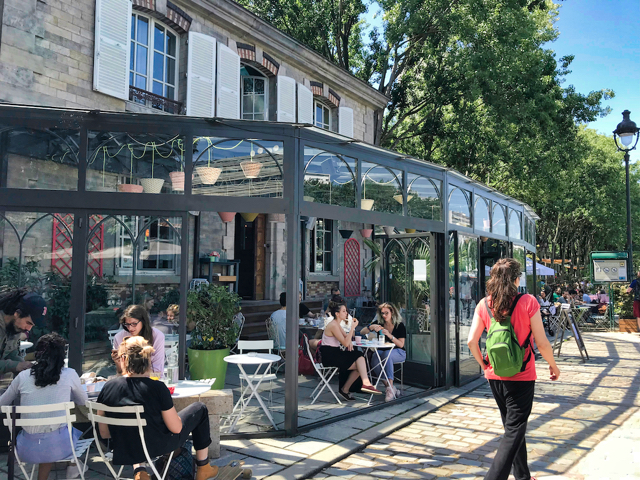 Shared on our favorite Tastemade series, Alice in Paris, we couldn't wait to check out this waterfront coffee shop, restaurant, and office workspace, Le Pavillon des Canaux. 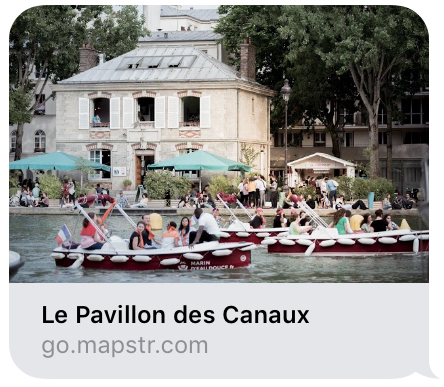 Located along the Bassin de la Villette, the largest artificial lake in Paris linking to the Canal St. Martin, this 130-year old former residence of the canal attendant was designed to make you feel at home. It will take a little extra time to reach the 19th Arrondissement, but it's well worth the trip to experience the buzzy corridor of shops and restaurants surrounding the lake. Simply order inside from the daily menu and grab a cozy table among the many living room-style spaces or outside on the garden terrace (we were lucky to snag a spot). Expect homemade salads, soups, tapas, and custom juice blends, organic wines, plus coffee from local roaster Lomi. Check their events page for exhibitions, workshops, round tables and screenings (mostly in French, of course). Open Mon-Wed 10a-midnight, Thu-Sat 10a-1a, and Sun 10a-10p. Tucked away in the 7th arrondissement, this was truly a travel-by-wandering discovery. Of the many markets that pop-up throughout Paris, this one along Rue Cler is one of a few that are permanent and open Sundays when so many other places are closed in Paris. The pedestrianized walkway allows easy perusal of the many market stalls, restaurants, bars, and shops. Don't miss Italian deli Davoli, a creative cocktail from L'Eclair, the incredible variety of cheeses at La Fromagerie, and signature chocolates from Francois Pralus. Rue Cler market stalls are generally open daily 9a-6p, while shops and restaurants may be open later. Many shops closed Mondays. Are you planning a vacation to the City of Lights? Check out our curated Paris Destination Guide! While en route to one of my favorite Parisian bakeries, Poilane, we came across this gorgeous jewelry boutique and spent quite some time admiring the earrings, necklaces, and rings. Drawing inspiration from nature, the jewelry brand Saoya began in Provence and has since expanded to seven cities throughout France, including two shops in Paris. These affordable statement pieces caught my eye, particularly the Rivage collection of watercolor beads and stones. Open Mon 11a-7p, Tue-Sat 10:30a-7p, closed Sundays. 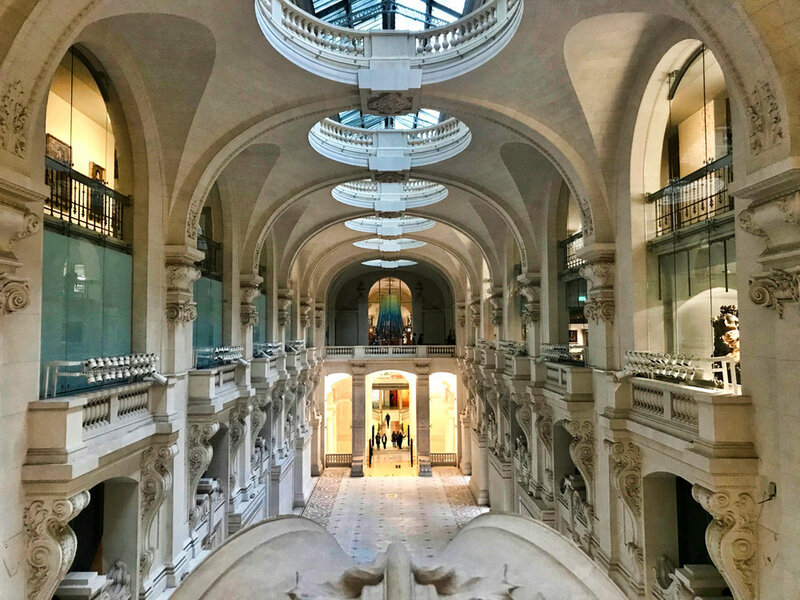 Housed in a wing of the Louvre palace, the Decorative Arts Museum is now my favorite museum in Paris. Founded in 1882 to promote the applied arts, the museum is dedicated to connecting industry and culture, design and production. Throughout the permanent collection of furniture, tableware, and art, discover entire rooms dating from the late 1500s to the early 1900s that have been recreated, including a gilt study, a hotel drawing room, and Jeanne Lanvin's Paris apartment. While we didn't have time, the garden terrace of the onsite restaurant Loulou looks lovely for a long lunch. Much quieter than the Louvre Museum next door, this is a must-visit during your Paris vacation. Open Tue-Sun 11a-6p, closed Mondays. Temporary exhibitions open late until 9pm on Thursdays during select months. Part living room, cocktail bar, and curiosity shop, Le Comptoir General is well worth the time it takes to find the hidden entrance off the Canal St. Martin. Don't expect any signs, just follow the locals during the day (and the long line at night). A small garden connects two immense shabby-chic rooms filled with greenery and designed for conversation. Open Mon-Thu 6p-2a, Fri 4p-2a, and Sat-Sun 2p-2a. For more Parisian inspiration, travel tips, and self-guided walking tours, view our curated destination guide! What are your must-see places in Paris? Share your tips with the Compass & Key community in the comments below!